Upstate University Hospital's new Discharge Hospitality Center at Downtown Campus will assist patients through the discharge process and open beds for new patients. Upstate University Hospital’s Downtown Campus is launching an innovative process for discharging patients. The Discharge Hospitality Center is a newly-designed space created to serve patients who are ready to be discharged but may be awaiting transportation, durable medical equipment, or medication delivery. The Discharge Hospitality Center—located on the second floor near the cafeteria—is capable of serving up to 12 patients and is complete with comfortable chairs, recliners, a television, and refreshments. 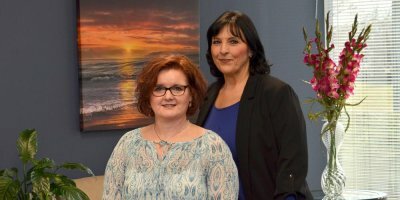 The lounge, open Monday through Friday from 10 a.m. to 6:30 p.m., will accommodate adult patients who are able to care for themselves independently or who require minimal assistance. Staffed with a registered nurse at all times, the Discharge Hospitality Center is equipped to monitor patient status, educate patients on discharge instructions, and “maintain the highest level of care our patients expect and deserve as they await their final step before leaving the hospital,” says Loretta Johnson, BSN, RN, patient flow administrator at Upstate. Scott Jessie, MS, RN, NEA-BC, nursing director for Emergency Services, says the space is a win for all involved. “By providing this space to our discharged patients, we will be able to better meet the needs of new patients coming through our emergency departments and operating rooms, along with direct admissions and transfers from other facilities.” Jessie says the team involved with the execution of the plan learned about the effectiveness of discharge lounges from hospitals throughout the country. 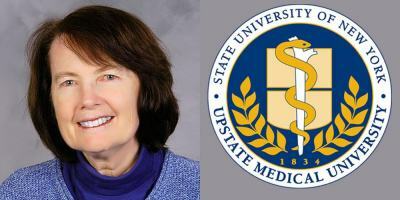 “They have proven to be an important part of the solution to patient throughput and capacity problems around the nation, and now it’s here at Upstate,” said Jessie. In addition to freeing up inpatient beds, the act of moving patients to the Discharge Hospitality Center assures patients and their families that staff is actively working to get them home or onto the next step in their medical care journey. 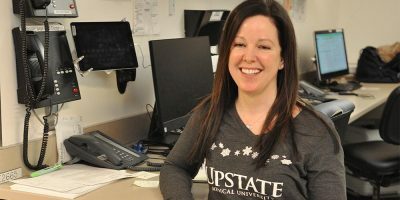 Lauren Winters, associate planner for University Health System Planning, said the creation of Upstate’s Discharge Hospitality Center took about 10 weeks and the work was performed by our own in-house construction team. The Discharge Hospitality Center will begin serving patients March 25. Last Modified: March 22, 2019. Contact Kathleen Paice Froio with questions about the content of this page.